Cedar is a popular choice for topiary specimens, and it's small wonder why. These statuesque evergreens take well to being pruned and shaped in a variety of different ways, and remain lush, green, and full throughout the year. Its growth habit makes it an ideal specimen for bonsai and topiary training. Not every yard or garden has the right characteristics to support a live cedar, and not every grower has what it takes to care for one of these long-lived plants. Luckily, this realistic looking 18 inch cedar ball with limited UV resistance makes for an ideal substitute. Unlike live plants, artificial plants are perfect even for novice topiary gardeners. Since they don't grow, they'll maintain their shape and good looks with very little maintenance. There's no need to worry about proper growing conditions, soil amendments, or finding the perfect place for planting. With this artificial cedar specimen, you can just set it wherever you'd like, keep it free of dust, and it'll stay looking good for years. Not all artificial plants are suitable for outdoor use, but this one does double-duty as either an indoor or outdoor piece. While it looks gorgeous indoors, this topiary's limited UV resistance means that it can easily be used outdoors wherever the sculptural beauty of a topiary plant is desired. 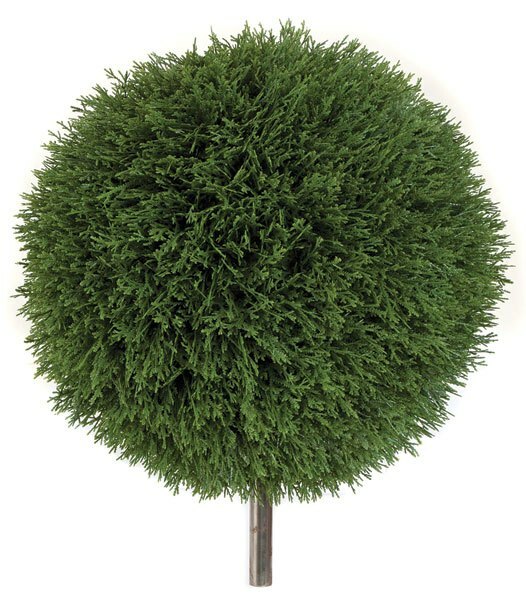 Unlike cheaper artificial plants whose materials tend to fade and break down when exposed to natural light over time, this topiary has some UV protection to help ensure that its color stays bright and vibrant even with some sun exposure. If you like the idea of having a topiary specimen, but don't have the time, money, or proper growing conditions to care for one, an artificial plant may be the best choice for you. Indoors or out, you can't go wrong with this 18 inch cedar ball with limited UV resistance.